From an iconic auto parts retailer hoping to shift into reverse after a streak of negative quarters to the world's most valuable consumer tech giant showing off its new gadgetry, here are some of the things that will help shape the week that lies ahead on Wall Street. 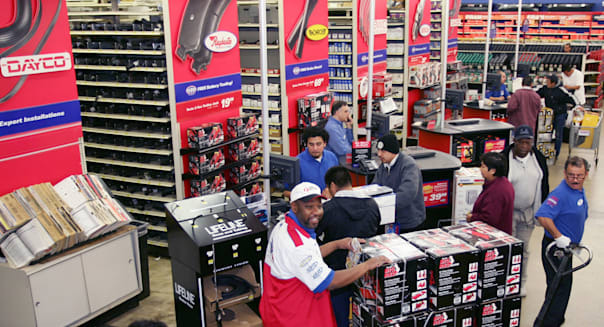 The new trading week kicks off with Pep Boys (PBY) reporting quarterly results. The auto-parts retailer and provider of car maintenance and repair services has 800 locations across the country. This has historically been an all-weather niche for investors. When the economy's smoking, drivers spruce up their rides. When the economy's in the tank, drivers hold on to their cars longer, requiring more money invested in maintaining and repairing their vehicles. This doesn't mean that investors should be expecting a strong report. Analysts see flattish earnings and sales growth. Making matters worse, Pep Boys has fallen short of Wall Street's profit targets in each of the four previous quarters. The trend suggests that Pep Boys may earn less than the 17 cents a share that the pros are forecasting. We will finally get our first look at the iPhone 6 on Tuesday. Apple (AAPL) has scheduled a media event for Tuesday, and this is the time of year when the world's most valuable consumer tech company refreshes its smartphone line. Everything is pointing to a larger device. Sources have been telling tech blogs that we're also looking at a scratch-resistant screen and a chip-based transaction platform. We may get more than just a shiny new smartphone out of Apple. Some have suggested that Apple will finally make its big splash into wearable computing. Apple could also update some of its other product lines or shock the world in a good way by entering into a brand-new product category. A handful of retail chains will be updating the market with fresh quarterly reports. Wet Seal (WTSL), Five Below (FIVE) and Men's Wearhouse (MW) are just some of the store operators checking in with new financials. Five Below and Men's Wearhouse are expected to check in with strong double-digit sales growth, but Wet Seal is going the wrong way: Analysts see another loss on declining sales. There always seems to be winners and losers in retail. The mall apparently isn't a level playing field. Vanity is still a good business. Ulta Beauty (ULTA) runs a chain of 696 namesake retail outlets that offer a broad array of beauty care products while also providing a full slate of salon services. Ulta Beauty reports quarterly results on Thursday, and it should be another period of encouraging growth. Back in June, Ulta offered up robust guidance for the quarter. At the time, it saw net sales growing from $601 million a year earlier to as much as $717 million. Brisk expansion and a forecast for comparable-store sales to climb between 5 percent and 7 percent -- on top of the 8.4 percent comps spike a year earlier -- suggest that beauty products and treatments are beautiful to investors. Fridays are usually quiet on the earnings front, but that won't stop Olive Garden parent Darden Restaurants (DRI) from posting its quarterly results. Darden finally sold its Red Lobster chain for $2.1 billion this summer, but it also recently delayed its annual shareholder meeting. With Olive Garden's comparable-restaurant sales in a funk, there's pressure on Darden's other chains to carry the load despite being a lot smaller than the Italian casual-dining restaurant. With activists angling for more say in the boardroom, it will be important for the struggling restaurant operator to deliver reasonable results in its final quarter before its rescheduled annual shareholder meeting. Motley Fool contributor Rick Munarriz has no position in any stocks mentioned. The Motley Fool recommends Apple, Five Below and Ulta Salon, Cosmetics & Fragrance. The Motley Fool owns shares of Apple and offers a look at the company of what could be its next smart device. The Motley Fool is short Five Below. Try any of our Foolish newsletter services free for 30 days.